Ramiro Gomez is a Los Angeles-based artist widely recognized for his re-imaginings of David Hockney's iconic paintings as well as other classic images that give us "the look" of Southern California. 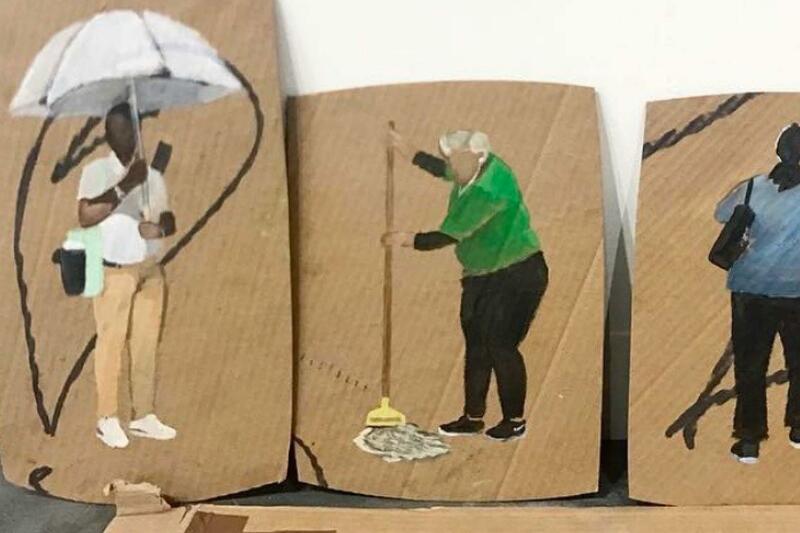 Gardeners, pool cleaners, housekeepers, nannies-or faceless, dark-skinned, disposable bodies that sustain cities and luxurious lifestyles-are at the front and center of Gomez's drawings, paintings, sculptures, and installations. Gomez's subjects key into his ongoing artistic project of making labor and hierarchies visible. His visuality and cultural interruptions illustrate what the New York Times dubbed as "Domestic Disturbances"-everyday familiar scenes that cast light on "questions of the relative worth and value of human lives." Gomez's work has been exhibited at the Smithsonian National Portrait Gallery; the 2017 Whitney Biennial; Art Basel Miami Beach; Los Angeles County Museum of Art (LACMA); and the Denver Art Museum (DAM), among many other venues. A volume on his work, Domestic Scenes: The Art of Ramiro Gomez, was published by Abrams Books in 2016.